Day 465 - Hand over the money and your phone number! The local news told the story of a robbery yesterday that is worth mentioning. The robbers held up the clerk AND one of them asked her for her phone number to set up a date! Good grief. She did not comply - though that might have been a way to catch them later on. So, with all this 'robbing' stuff going on, I dreamt last night that (carelessly) I left my pocketbook hanging by the front door (wasn't our house, it was an apartment complex). When I returned, my wallet was gone, but I found it in a sack of trash that was also by the door. Someone had removed my wallet, rifled through the obvious compartments, but left my license, credit cards, and some hidden money still there. Apologies for the short blog, I need to get ready and go this morning! TTFN! School isn't out yet in New England, but it is here. Everyone is going on vacation. Word to the wise - be careful, because there are thieves everywhere! I hate to say that, but it's true. 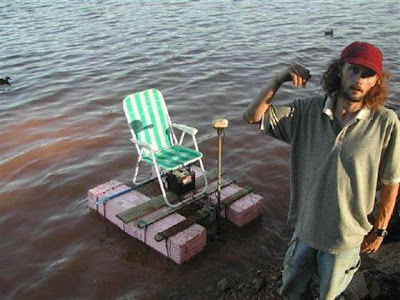 First - today's photo is of a 'redneck bass boat' - I don't think he has to worry about it being stolen, except for the motor and battery. I have TWO stories of theft from Memorial weekend, thankfully we weren't affected by either one. We were at a marina this past Friday night. We would be launching from there the next day. Two sunburned guys in a fancy black and red bass boat complete with a huge motor were launching their boat. We noticed they weren't very good at it, and didn't adjust the motor's depth properly (the motor starts out tilted up. You push a button and an electric mechanism lowers it into the water). When they left the 'no wake' (which means no waves) zone, they REALLY opened it up and went screaming off into the lake at a very steep angle. He sat down to wait for them to return, saying 'They won't go far, there's not much gas in there'. Evidently someone he knew TOOK his boat and left him behind. Nice buddies, guy. Then - Monday morning I was filling my car with gas at the local (8 miles away) gas station. A man next to me was filling his motorhome. He came around the pump to speak to me, and said in a calm voice 'I did this yesterday, and someone stole all the gas out of it'. I exclaimed again 'No way!'. He said he thinks a neighbor is on drugs and stealing anything he can get. Meanwhile - the gas pump was already at $100. I asked if the gas cap on the motorhome has a lock on it. He said no, but that would be the next purchase for it. Can you believe that? 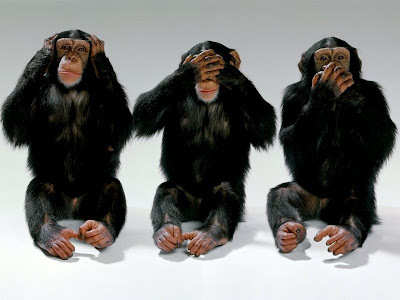 Two theft incidents in three days. Good grief! If you own a motorhome - be forewarned - buy a lock for the gas tank! TTFN! Day 463 - A Short Week to Look Forward To! Charlie is off this week, but I have to WORK. Sheesh. Yesterday we attended a cookout hosted by our longtime friends GK and PK. We had a great time, eating cheeseburgers and hot dogs (and chips n dip, fresh vegetables, baked beans, cole slaw, broccoli casserole, potato salad, and ice cream sundaes) and chatting and telling tales, mostly on one another! 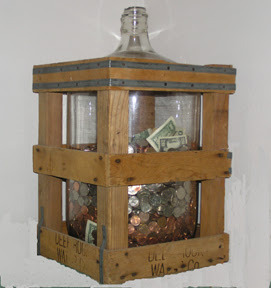 SOMEONE we know is used to the little change cup next to the register at gas station convenience stores, the kind where you leave a few pennies or take a few pennies, as the need arises. SOMEONE was in Starbucks, and used the same maneuver to extract 50 cents or so - the amount of change he needed - from the employee TIP JAR on the counter. SOMEONE'S companion busted him for that - his thinking was that since the coffees were so expensive, the amount of change he could take from the jar was proportionally larger as well. Charlie countered by telling his famous 'Varmint Chili' tale - which produced tears of laughter around the table. You don't remember that one? Charlie was on American Airlines, and with an upgrade coupon was flying first class from Chicago to Providence (they laughed about the symbolism of Charlie in First Class too). When he arrived, he told me they had tried to serve him 'Varmint Chili' for lunch, and that he had opted for the other entree, a ham sandwich. I explained to him - 'No, they did not try to serve you 'Varmint Chili', no one even uses a word like 'Varmint'. They tried to serve you Vermicelli - which is NOODLES'. Case closed. Have a nice Tuesday, everyone! TTFN! Day 462 - Happy Birthday Mom and Happy Memorial Day! Happy Birthday to my mother, and Happy Memorial Day to everyone else! Mom, I hope my card arrived! 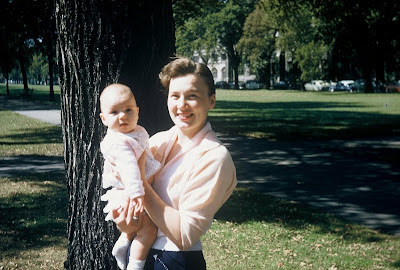 Here is a photo of my mother and sister Marcia in the late 50's. Lovely, Lovely, Lovely. It's nice to have a mother who is beautiful inside and out, isn't it? Realization of the day: Gosh, I think I love Monday if it's a Holiday! What a difference a holiday makes. On a work day, we'd already have been up half an hour. On a Holiday, I feel like I'm getting up early. We have a cookout to go to that's about an hour away, and we were notified to arrive anytime after 10:30 this morning. That means I'm going to go to swim very early, then we'll get ready to go when I get back. TTFN and Happy Birthday to you, Happy Birthday to you, Happy Birthday dear mother, Happy Birthday to you! After I go swim I'm going to catch a super-early matinee to see the new Pirates of the Caribbean movie. In honor of the holiday weekend, Opry Mills is starting their matinees at 9AM! That is awesome, because I can pop over there after swimming to see a movie, then still have the rest of the day to shop and do my errands. We're attending a cookout tomorrow, and I am bringing the fixin's for ice cream sundaes - ice cream, waffle bowls, bananas, sauces, whipped cream, and nuts. Charlie has an archery shoot this morning, so we'll go see 'Pirates' again together another day. Tomorrow is an important day - a holiday to remember our beloved heroes in the military, AND my mother's birthday! Way to go soldiers! Way to go mama! Buddy Joe and I went to see the 11am showing of 'Pirates of the Caribbean'. Charlie had fun at his archery shoot, and I made BBQ babyback ribs for dinner - YUM-O! I picked up chocolate sauce, ice cream, whipped cream, bananas, nuts, and waffle bowls to bring to the cookout we're attending tomorrow. We've been away overnight at our friends 'fishing camp', and been boating on the Tennessee river, and been to visit a freshwater Pearl farm. We had a great day and thanks to 30 spf sun block, I am not burned! If you want to read about the pearl farm, click this link. Thanks thanks thanks to our friends TY and SY for inviting us. We had a wonderful time! I'm going swimming early tomorrow, but I'll blog more eventually. Have a great weekend, everyone! 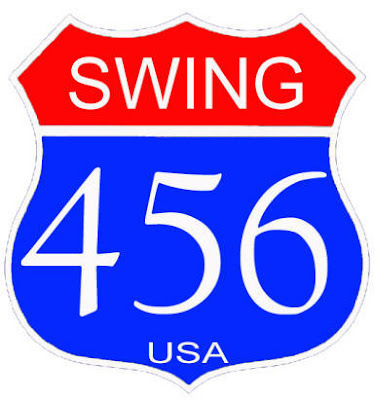 Day 459 - Happy Memorial Weekend! The new Pirates of the Caribbean movie starts today. Gotta go see my ORLANDO BLOOM-age, even though he won't have on a Legolas outfit and a blonde wig. 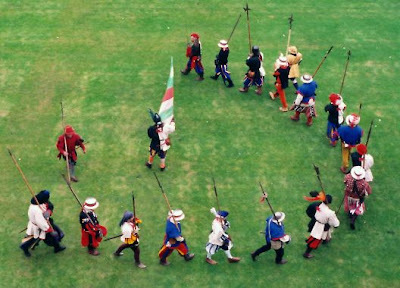 A funny story - every weekend in May we have a 'Renaissance Festival' here - complete with a tour of a 'castle', sword fighting, people in Robin Hood/Maid Marion garb, camel rides, falconry and jousting, etc. Okay, my favorite part of the fair is the one pound or more smoked turkey legs they sell at the food court. We haven't been in several years. THIS year someone at work attended the Festival. They informed me that all the studly pirate-types had on a lot of eyeliner like Johnny Depp, AS IF that is what a tough and macho, swaggering, sword fighting male OUGHT to look like. HA HA HA - how on earth did THAT get started? Sheesh! I can hear it now - 'My kingdom for a new mascara!' 'Scour the countryside for the Avon lady and present her to me!' 'My queen, can I borrow your lipstick?' EEEEEw! Have a nice holiday weekend everyone! TTFN! Day 458 - Don't BUG Me! I murdered a spider in the guest bath this morning. Sorry, PETA. 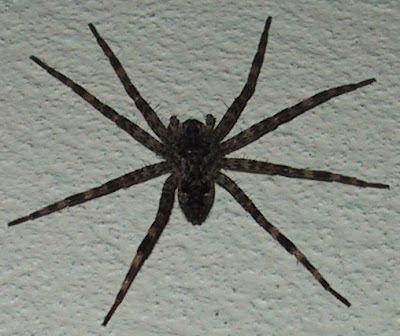 No, it didn't look like this one, I just don't have time to find a picture of the exact kind of spider I killed. The interesting thing is the spider RAN from me - it ran as fast as it could with it's many, many little spidey legs. Rather humorous. I was much faster with my little wad of toilet tissue. In no time it was on it's way to the septic tank. Sorry, Spidey. Yesterday I murdered a beetle in the kitchen during American Idol. NO, it was not a roach. Sorry, Beetle. When my mother kills a bug, she keeps killing it until there isn't much left. Right, Mom? Changing subjects - Congratulations to Jordin for winning American Idol! I am happy she won, and I'm sure Blake will do just fine in second place. Did you see all the stars in the audience? American Idol is a place to be seen I guess. When Bette Midler was singing, it looked to me like Jerry Springer was crying. Did you see that? More Reality TV - don't forget that the 'Do you think you can Dance' show starts tonight! We always enjoy that one. I am running a bit late this morning, it's already 6:15. Have a great Thursday - it's Memorial Weekend Eve! Day 455 - Monday - Ooops! I just hit a few keys and published the blog by accident, more in a few minutes! Cracker Barrel tonight, that's something to look forward to! Congratulations to our friends TY and SY - their daughter was married on Saturday. The newlywed couple can officially make pet names for each other - for example..
Charlie keeps laughing because I called him a 'hairy pile of testosterone' the other day. I think he's proud of it. Have a nice Monday everyone! TTFN! 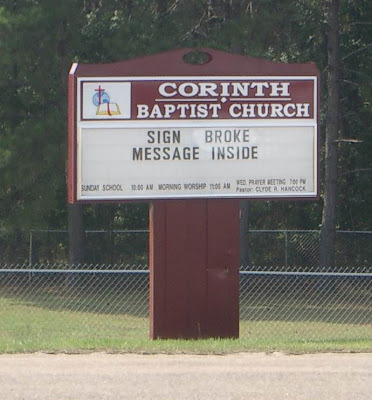 I have seen this very message on a local church sign here. I always read their messages as I pass by (maybe that's OCD of me). Anyway - the message on the church near us says 'Count your blessings, not your problems', and I think that's a good message. 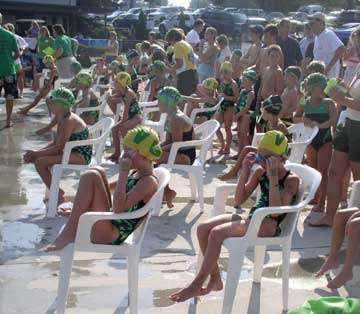 I'm leaving to go swim but I'll blog more later and tell you a couple of funny things about the fish fry yesterday. I'm back - it's nearly 4pm and I've had a nice day. The pool was lovely and warm this morning, and I was alone in the pool for most of my swim. Our hosts have this 'artificial dog' that looks like a dog with his head buried in the garden, but actually it's a headless dog. I mentioned it, and they turned the battery switch for the dog to 'Do it's thing'. It wags it's tail and makes fake 'passing gas' noises. How adorable is THAT? (kidding). Look! I found it on the web! It is Digger the Dog! Day 453 - It's Freezing Here! It is THIRRRRRRTY-NINE frozen degrees outdoors this morning in Late May! Holy Moly! It is only 64 in the house, it's chilly! 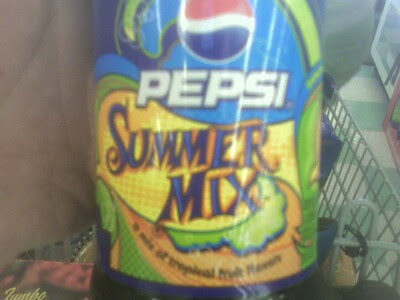 Sorry about the blurry photo this morning, but I'm having a hard time finding a picture of the new soda - Pepsi Summer Mix. I noticed it the last time I went to the grocery store, and it made me look twice. To ME, it sounds like someone took the idea from Pete's Wicked Summer Ale and Sam Adams Summer, etc. and applied it to soda. No, I haven't tried it and I probably won't, either. I just thought it was interesting that we have SOOO many flavors of soda already, but we need ANOTHER flavor just during the summer. Okay. The life of promotions and marketing. Charlie and I are going to a fish fry this afternoon - it is expected to be high 70's by that time. Whew. That's good, because I've had enough of this global warming! TTFN! Day 452 - Friday! Friday! Friday! Greetings, Bloggy End-of-Weekers! It's Friday again! I got a pop-up notice on Blogger just now with a message that Blogger 'saves your drafts automatically'. Well, thank you very much. You know why? Because if it didn't, then people like ME LOSE THEIR WORK if blogger goes down or can't connect. 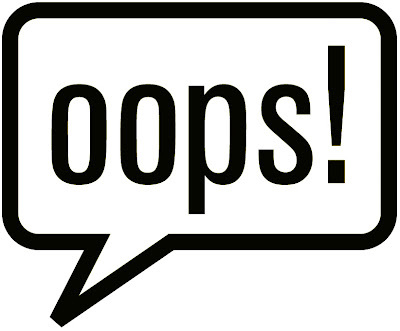 Read the archives if you want a few examples of times I've lost my whole blog entry. OOOOoo Karen - you sound kind of grouchy this morning... Actually, I'm not. Charlie and his brother are going FISHING this morning, so I'm just jealous. I've accrued ONE WEEK of vacation time at the moment, and need TWO to take this summer or I'll need to take unpaid leave. I also need to take Thanksgiving week off. I do NOT like only having 2 weeks vacation per year. FOUR years to go before I pick up another week. Oh - blogger just autosaved my work in progress. Thanks, little Blogger background utility. Three team members at work are out today, so I need to watch the helpdesk for a while before my first meeting of the day at 8:30am. (yawn). Happy Friday, everyone, and have a nice weekend! Speaking of the weekend, Charlie and I are going to a fish fry tomorrow - we'll be eating the fish (cut into filets and fried with cornmeal breading) he and his buddies caught and froze last month at Kentucky Lake. I need to bring sausage balls for an appetizer - they are made from hot pork sausage, water, bisquick mix and shredded cheese, baked in the oven. They are yummy and fattening. Day 451 - Hey! That wasn't supposed to happen! Greetings, Bloggy American Idol Watchers! 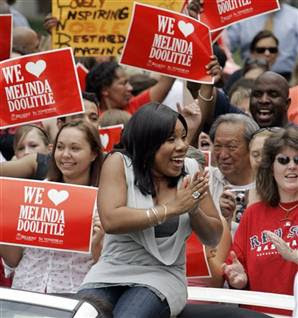 I'm upset that Melinda Dolittle (from Nashville, by the way) did not make it to the final on American Idol! The only reason I can think of is that so many people voted to get Blake and Jordin INTO the final two that the votes surpassed Melinda's. Sigh - well, I know she will have a wonderful career in music anyway, but I wish she had WON. Out of the final two, I predict Jordin to win it, and am happy for her if she does. I wanted Yau-man to win Survivor. Yau-man made it to the final three but didn't make it to the final two. I wanted Melinda to win Idol. Melinda made it to the final three but didn't make it to the final two. It must be ME. Sorry, Yau-man. Sorry, Melinda. I jinxed you both. Good luck Jordin! I like Blake too, but everyone knows Jordin has the better voice and as Simon always says - 'This is a SINGING competition'. TTFN! I have a training class at work all afternoon, I hope I get some work done before then! Day 450 - Too Much Information - The Return! Too Much Information has returned with a vengeance! It's back for an encore! Do not read further unless you really WANT to hear about my visit to the dermatologist to have some skin tags removed, because I have decided to TELL ALL. What is a blog if not a vehicle for just these types of situations? First - let's talk about 'skin tags' for a minute. You know what they are, don't you? Little evil mole-relatives that seem to grow on your skin like mushrooms on a log? Since I am losing my mind, I also keep thinking of them as 'hang tags' for some reason. However, before I ever heard the name 'skin tags', I used to call them 'pully moles', because they stretch. Well, they DO! How many people are saying 'EEEEEEWWWW' and meaning it? I arrived a few minutes early, which is always a good idea in case you have to fill out any paperwork or sign anything. There were several other near-comatose people in the waiting room, waiting and waiting for their name to be shouted out. Oh Joy, they're calling ME!!! I was ushered to Room #5 by the teenaged-looking medical assistant, given a gown (to put on with the opening in the back) and left in privacy for a few minutes. The medical assistant and the doctor arrived shortly, and we got down to BUSINESS. Left armpit first. The removal process consisted of clipping (with small scissors) or cutting (with a small scalpel) these skin tags off, with or without a shot of numbing agent first. Sometimes it hurt, sometimes it didn't. Then a sizzle (I'm not kidding) to stop any bleeding with a cauterizing (read that soldering) iron. Then a swab with some kind of wet stuff that stung, then a swab with polysporin goo, then a bandaid on a few bigger places. The only humorous part was when the doctor was removing a skin tag under the left cheek of my ...derriere. She murmured to the assistant - 'Hold this up for me'. The assistant didn't know what she meant and she repeated 'Hold this up for me?' The doctor said, 'Her left buttock - hold it up'. I died a thousand deaths of mortification, standing there while the doctor sawed away on my rear end. Thanks, doc. One last thing - when I went to the desk to pay the bill, I noticed a little sign that said 'Check out'. I put my credit card on the counter and said 'Checking out of Room 5' and made the receptionist laugh. All in all, a worthwhile way to spend a hundred bucks, be peppered with tiny red scabs for a while, all to get rid of some ugly mole-relatives. You may not agree, but I think it was worth it. TTFN! Day 449 - Too Much Information! There is just TOO MUCH INFORMATION coming at me lately. TMI for short. Charlie knows someone who made a business call yesterday. The 'callee' was unavailable, and the administrative assistant proceeded to explain to the 'caller' that he had just had surgery of a VERY private nature (that she referred to as 'pecker surgery') and told ADDITIONAL information about it that didn't need to be told. In short (no, that was not a reference to the callee), TMI. Then, at Cracker Barrel last night - our waitress, who we have had before and who has adopted us as her very favorite and personal friends, proceeded to tell us (while we were eating) about her FEET and all the walking she does in her job, and her foot problems. Excuse me, but your FEET are not what I want to be thinking about while I am EATING. While I am EATING, I don't even want to recognize that you HAVE any FEET. TMI again. That's the TWOFER TUESDAY - TWOFER TMI. By the way - speaking of the unspeakable... After work today, I am having some skin tags removed at the dermatologist's office. No more information, if you please. Also - welcome home to my various relatives recently returning from Ireland, and a special, Belated Mother's Day greeting to my mother. Bye for now! It's Monday again, and today will be my first day back at work after several days out of town. I am bringing muffins and coffee to work today to celebrate our return. 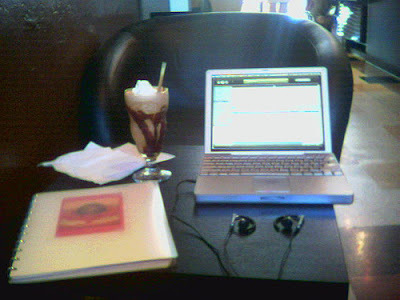 I like today's photo - a computer, some headphones, and an ice cream sundae. Sounds good to me! Charlie and I were disappointed that Yau-man was not in the final 3 of 'Survivor'. He very much deserved to win it, and I have also lost respect for Earl. 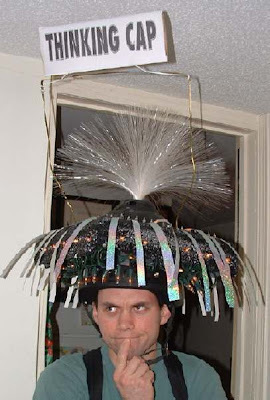 Earl knew that he had to prevent Yau-man from getting to the final three because he would have had everyone's vote. I hope that if I were in his shoes, I would do my best to ensure the RIGHT people got into the finals - the people who deserved to be there - not just the people I could beat. That is the RIGHT thing to do. I think we should get a million people to send Yau-man $1 each, and a million people to send a note to Dreams that we're glad that lying and backstabbing people didn't win him a million dollars. Dreams should give Yau-man back his truck as well. That's enough preaching for this morning. Cracker Barrel tonight, it's been a long time! TTFN! Day 447 - Happy Mothers Day! Greetings, Moms and any near-Moms out there! Happy Mother's Day! Charlie and I started celebrating yesterday with an outing to see Spiderman III - we enjoyed it! Then to Chili's for Mango Margaritas and bacon cheeseburgers. YUM-O! I've just opened my Mother's Day gift from my daughter and son-in-law - my very favorite dark chocolate cranberries from Nantucket Chocolatier! I'm leaving shortly to go swim, then shop, and basically do whatever I want today, because it's Mothers Day! My mother is vacationing in Ireland right now, so I can't call till she gets back. My mother used to tell us to 'go outside and kick a tree' if we were angry, instead of beating on each other. My daughter had an after-school job at a day care when she was a teenager - she told me she 'sounded just like me' when she was there. One of the best things about being a Mom is children's artwork on the fridge. My mother makes the BEST homemade bread in the world. Thank you, Mom. My mother would say things like 'I think you're a nice size' when you're fat. Happy Mothers Day, everyone! Don't forget that tonight is the Survivor Finale show! 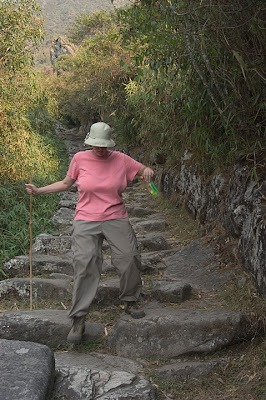 Day 446 - The Prodigal Blog Returns! The blog returns - let us feast! 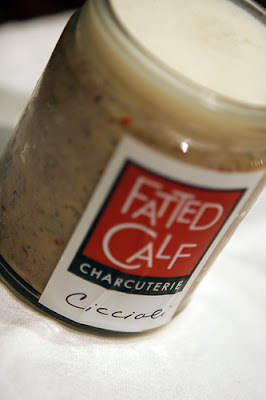 Kill the fatted calf? Pick a leg, and I'll make it diet. I got home about midnight last night, and stayed up till 1am having some midnight gumbo from Papa Boudreaux's. Charlie and his brother went there yesterday and brought me back some seafood gumbo. Flights back were mostly on time, and I must say that the Kansas City airport is the strangest airport I've ever seen - one long, long, long hallway with all the gates, security stations, and baggage claim areas all on the same floor. Very odd. The conference was a success, and everyone had a good time and learned a lot. It will take us till Monday to recuperate from Pacific time. By the way - Happy Mothers Day Eve! Heather, your package arrived safe and sound and it's on the kitchen table waiting for tomorrow. Thank you thank you in advance! Reminder - the price of stamps goes up .02 on Monday - mail anything you can this weekend! That's it for now - hope everyone had a good week too! You are on your own while I am at my conference - this is just a reminder to use the comments to talk to each other (quietly) while I am gone. I won't have time to write in the morning because I am going out the door at (gasp) 5:15am. EEEk! I will try to say Hi from Seattle, time and computer access permitting. Have a great rest-of-the-week and I'll be back LATE Friday night. Blog at ya on Saturday. Day 441 - Moanday Moanday! Greetings, Bloggy Commuters! It's Monday! Rise and shine and put on your thinking caps - it's going to be a busy week! Doesn't this 'thinking cap' guy in the photo look a lot like Jim Carey? He does to me! Announcement - I am leaving early tomorrow morning for a computer conference in Seattle. I won't be back till very late Friday night, and I don't know if I'll be blogging at all during that time. We will be so busy there with sessions and events that there isn't much 'free time'. Feel free to use comment postings to have your own conversations without me! I put in 5 or 6 hours of work from home this weekend and made some progress on my project (which was originally due TODAY but that may slip). Have a wonderful week this week (blog or no blog), and I'll try to say 'Hi' if time permits. TTFN! Greetings, Blogregation! It's Sunday, and that's a beautiful thing. 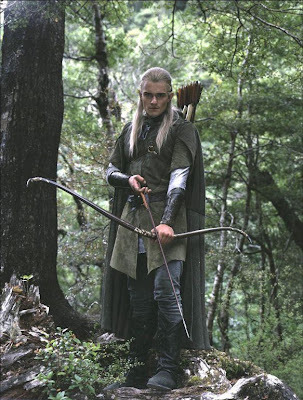 To answer a question posted by Heather - No, I haven't lost interest in my '6-feet of fair haired and studly Mirkwood Elf', Legolas Greenleaf. However, I will admit that Orlando Bloom is a tad too young for me, I wouldn't want to be branded a 'cougar' like some older ladies out there. I thought I had invented a new term called 'Manopause', but upon investigation, it is alive and well on the internet. What isn't? One example of 'Manopause', very close to my heart and wallet. I am not complaining, I am stating a fact. Apologies to Charlie if he thinks I'm picking on him. It took a Mythbusters episode to convince Charlie that it is more cost efficient to turn OFF a light than to leave it on all the time. There was no behavior change after this episode, however. Charlie just doesn't buy into turning off the lights or the television when he leaves the house or goes outside to work in the yard. I walk around and turn off four lights in the Den, the VCR, the TV, and the cable box pretty regularly. Charlie's reasoning - 'Well, if we were home they would be on'. Yes, and by the way, the electric bill is over $100 a month. TTFN everybody, and have a nice Sunday! Greetings, Bloggy Saturday Sleeping-Inners! Hooray, it's the weekend! 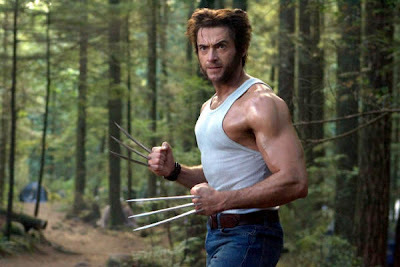 Today's photo is of Hugh Jackman as 'Wolverine' of the X-men - he's my favorite (she said with a purr). I've posted pictures of Jeff Probst and Simon Cowell, who would I like to post a picture of on the blog? I've already talked about Orlando Bloom as Legolas, so next in line for movie-cheesecake is probably Wolverine. Changing subjects but speaking of wolves - do you notice each month when it's the full moon, and marvel at it each time? I do. I also say 'Hi Moon' to the moon whenever I can see it while I'm driving to work early in the morning. Speaking of work, my demo went just fine yesterday. I took out the functionality that wasn't working right until I figure out how to fix it, hopefully over the weekend. Early Tuesday morning I am leaving for a computer conference in Seattle, WA - I'd like to have it fixed by then so I won't have a bug to come back to. Have a great Saturday everyone! TTFN! It's Friday, Hooray! March in a circle, chanting Fri-day! Fri-Day! Fri-Day! 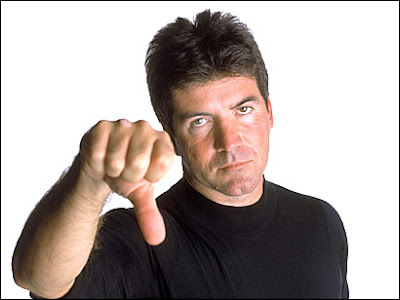 Today's photo of Simon Cowell is for Heather - she mentioned she likes him. I think Simon is OK some of the time, but unnecessarily abrasive other times. He 'could' just say 'No, thanks' or 'I didn't like it' instead of some of the looks and insults he comes out with. Without trying to be insulting, I think he should shop for some different shirts, I'm sick of him wearing the same thing all the time. Furthermore, I think that Paula ought to learn a new way to clap her hands, that opened finger spastic-clap irritates me for some reason. I am giving another project demo today at 2pm- a session so the 'chief high mucky mucks' can give their feedback - wish me luck. To help things out - I've had a bug since yesterday that affects export to Excel, and I had planned to export it and show the output during the demo. Sheesh. Evil Bloggyman should be happy about that. He is giggling, and marching in a circle, chanting 'Crash and Burn! ', 'Crash and Burn! ', 'Crash and Burn!'. Thanks, Bud-ro. For those Family Members about to go on Vacation... I hope you all have a wonderful trip and we'll talk to you when you get back! It's Thursday, and that's Survivorage Day! I'm skipping the pizza night this week, we are having hot dogs and beans or quesadillas with our 'Survivor' tonight. 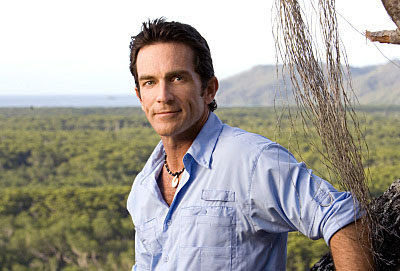 I'd rather post a photo of Jeff Probst than Simon Cowell, yes? By the way - I am rooting for 'Yao-man' (I did not double check the spelling) to win Survivor. Switching shows to American Idol, I had guessed the two who got voted off last night, and all my favorites -Melinda, Jordin and Kiki (I did not double check the spelling) are in the final four. Yesterday morning at 6am I mentioned that I was getting caught up on my project. By 10am all that changed and now I have even more work, and some rework to do as well. Drat. I spoke too soon and brought 'bad juju' on myself for saying that, didn't I? Have a great Thursday, Friday is just one day away, and TTFN! Day 435 - May Day! May Day! Greetings, you Bloggy Calendar Changers, you! 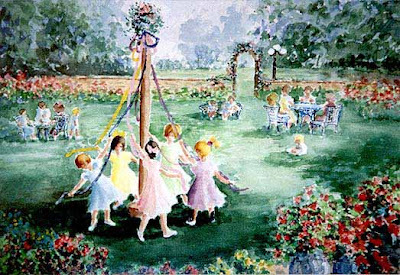 March in a circle around the maypole, please. I guess the days of maypoles and May baskets are pretty much over, aren't they? Hey - does anyone make May baskets anymore? Changing subjects - ear update. I am feeling normal again (ha!) except for the blockage in my ears. I am hoping that soon I will swallow or yawn or blow my nose and my ears will open. My manager said she had such a sinus infection once that she had to have a cortizone shot to reduce the swelling in her head in addition to her antibiotics. I love to change my calendars, I usually have several of them up in my office. I am a calendar-aholic, I guess. Gotta go - have a great Tuesday and a great May Day!